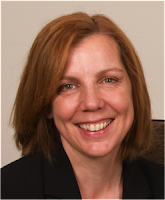 Weighty Matters: Guest Post: A MOOC on Weight Bias with Dr. Sara Kirk? Yes Please! Guest Post: A MOOC on Weight Bias with Dr. Sara Kirk? Yes Please! When my friend, colleague, and holder of the Canada Research Chair in Health Services Research, Dr. Sara Kirk reached out to let me know that she'll be offering a MOOC (Massive Open Online Course) on weight bias I immediately asked her if she'd write me a few words about same for Weighty Matters. She graciously agreed. I last provided a guest post on Weighty Matters in 2013 in which I discussed some of the research happening in the province of Nova Scotia, which explored the dialogue between a person with obesity and their health care providers through drama. This research was published last year and it highlighted the challenges that were experienced on both sides of the therapeutic relationship. It was not that health care providers did not want to support individuals experiencing challenges with weight management. They simply did not know how to do so within the constraints they faced, such as a system that is not structured to support chronic health conditions, and for a health issue for which they receive inadequate training. This need for more training has led me to develop, in partnership with Dalhousie’s Faculty of Health Professions, my first Massive Open Online Course (MOOC), which will be starting on April 20th 2015. A MOOC is a free, open access course that is offered fully online, providing participants with the opportunity to learn about current research and practices in a broad range of topics. 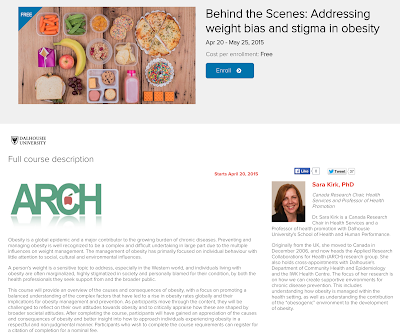 The MOOC, called Behind the Scenes: Addressing Weight Bias and Stigma in Obesity, builds on my research and the dramatic presentation that was created from the findings and will explore some of the personal and professional biases that surround weight management and that impact patient care and experience. I hope to be able to provide participants with an appreciation of the causes and consequences of obesity, and better insight into how to approach individuals experiencing obesity in a respectful and non-judgmental manner. Whether you are a health professional working with individuals seeking weight management support or just interested in learning more about what weight bias is and how it can impact health and relationships, this course will explore bias and stigma in health care and society and provide strategies to build positive and supportive relationships between health care providers and patients. Participants who complete the course requirements can apply for a citation of completion (for a nominal fee). For your FREE registration, please visit the course listing and registration page here. Dr. Sara Kirk is a Canada Research Chair in Health Services and a Professor of health promotion with Dalhousie University's School of Health and Human Performance. Originally from the UK, she moved to Canada in December 2006, and now heads the Applied Research Collaborations for Health (ARCH) research group. She also holds cross-appointments with Dalhousie's Department of Community Health and Epidemiology and the IWK Health Centre. The focus of her research is on how we can create supportive environments for chronic disease prevention. This includes understanding how obesity is managed within the health setting, as well as understanding the contribution of the “obesogenic” environment to the development of obesity.